Ask Samuel Brown to describe the style of hats he designs and he will tell you everything "from pillboxes to wide brims, halos, headbands, and church hats." The latter, often bold and flashy, are the kind traditionally worn to church by African American women. Having been raised up in the Baptist church, he was familiar with these crowning glories. "My mother was a hat wearer," Sam recalls. Like many women of a certain generation, Sam's mother and aunts wore hats every time they went to church.It was 1984 when Samuel started his millinery business, Sam�s Chapeau Designs. Looking for some extra income to support his growing family, he turned to hat making. " Nobody told me anything; I learned on my own. The passion was there. " Not only does he remember the colors of his first hat (pink and grey) he also recalls the trimming as being French windowpane netting. He has slowed down a bit in making and selling hats but Samuel Brown�s hat designs were big sellers at Toppers, once known as the hat shop in Boston. 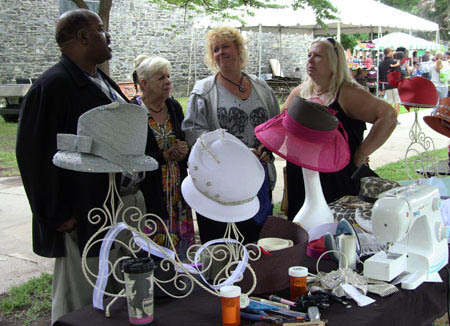 Customers for his hats ranged from churchgoers, bishop�s wives, visiting tourists, and women heading down to the Kentucky Derby. Having dressed women's head gear for years, Samuel is known for his knack of embellishing hats. He also designs shoes, as well as dyes shoes to match custom made hats.